The last few weeks have been vacation weeks here at Parkeology, as Teevtee and I have been trading off on different exotic locales. The only difference is, he gets to do things like go to Tokyo Disneyland or take a Disney Cruise, while I am basically just staying at home riding Star Tours over and over in a futile attempt to score the Boba Fett ending. The graphics are colorful, clean, and appealing, and this sounds like a great way to spend some time while in line at your favorite rides this summer. Right now, it’s a Disneyland-only version, but if it catches on, hopefully we’ll see some Florida hunts coming. I plan on putting this thing through its paces when I hit Disneyland this fall. The game’s designer is a former Cast Member, and he definitely knows his stuff. He was gracious enough to offer up some promo codes for our readers, if anyone is interested. First three people to email me using our handy new “Contact Us” form will get the game for FREE! That’s a savings of almost 8 million dollars, if each copy cost that. But it doesn’t, it’s only $1.99. Not too shabby! And while we’re talking about cool new projects from the large Disney community, let me also give a shout out for a book coming later this year, It’s Kind of A Cute Story. This is the story of Rolly Crump, who has to be one of the top Imagineers of all time (ever hear of a little thing called It’s A Small World?) What makes this book extra cool for me is that it was a collaboration with Jeff Heimbuch, who is a pretty awesome guy in his own right. You know that awesome Communicore Weekly show? (you don’t? Why not??) Well, that’s Jeff Heimbuch, who is one half of the Jeff & George team. 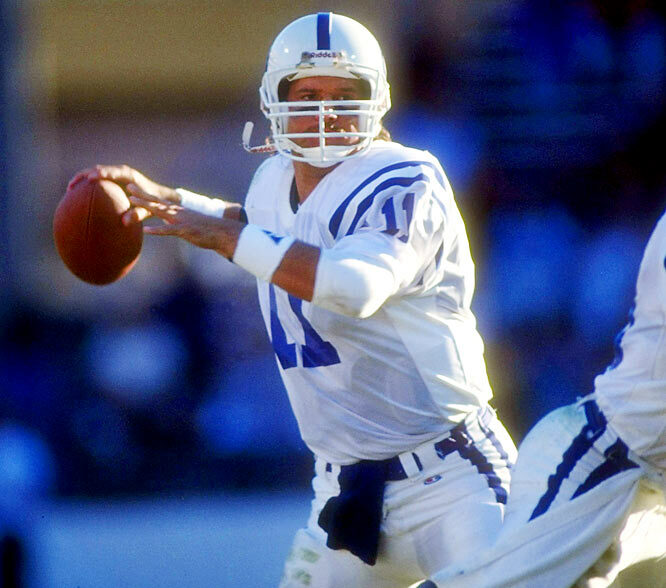 Not to be confused with Jeff George, who made my life as a Colts fan a living hell. Anyway, I’m really looking forward to this book, and just wanted to help put it on everyone’s radar. I’d encourage you to go ahead and Like their Facebook Page, to keep abreast of the latest news, publication date, etc. And feel free to like the Parkeology Facebook page too, while you’re at it. Just because. This entry was posted in Theme Park Life and tagged books, communicore weekly, rolly crump, video games. Bookmark the permalink. Thanks for the sweet shout out, dude. Much appreciated! Glad you’re looking forward to the book (hell, I am too, and I wrote the damn thing! ), and you’re a fan of CW. We totally have to get you on the show sometime soon! And agreed. SpyQueue is an awesome app. Can’t wait to get to DL to check it out IN the Park, and not just from my desk. Strangely enough, I can’t see any of those cool things the app tells me to look for around my desk. Anytime, my man! Definitely looking forward to this one. Yea… I’ve been Cruising and Tokyo Disneylanding and all of that but I have also done ZERO posting! Shane as repeatedly scolded me about this but I just don’t listen. I PROMISE that there are posts to come but alas it will still be a bit longer before that… but I knwo Shane has the answer to the secret Animal Kingdom door expose FINALLY ready to roll. I read a pre-release copy and it is breath taking.